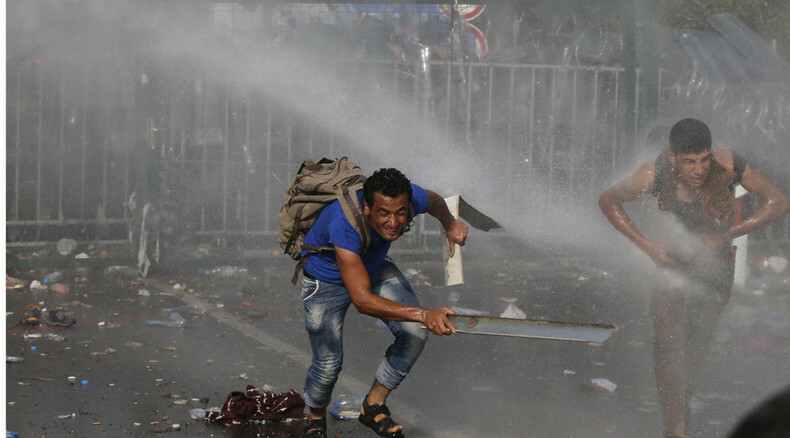 Hungarian police have deployed tear gas and water cannon against asylum seekers, who broke through a razor wire fence at the border crossing with Serbia. At least 20 police officers and two children have been injured in clashes, local TV reported citing the Hungarian PM's security adviser. "So far 20 policemen have been injured and ambulance services have just taken two children (to hospital) who were injured after being thrown over the security fence," Gyorgy Bakondi told public TV. "We will definitely restore the fence and strengthen the fence, and protect Hungary's security with all legal means." Police have been reportedly trying to control the crowd, who were throwing plastic bottles, stones and concrete at them. Thick black smoke is covering the area, as seen in the videos. Hungarian police told Reuters that several “aggressive” people had managed to break through the border gates. 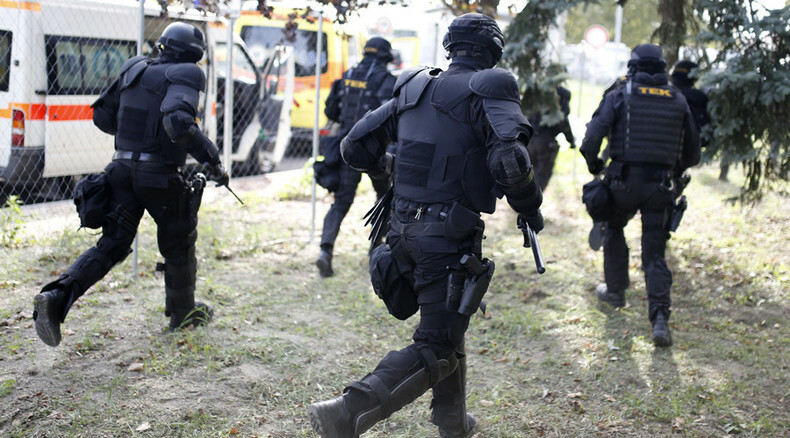 The incident took place at a border crossing between the Hungarian town of Roszke and Horgos in Serbia, one of the main frontier crossings in the EU. "Police are taking lawful and proportionate measures to protect the Hungarian state border and the external frontier of the European Union," law enforcers said in a statement. Hungarian Foreign Minister Peter Szijjarto has asked Serbia to act against asylum seekers on the Hungarian-Serbian border, Reuters said citing local TV. "A group of very aggressive migrants is persistently attacking Hungarian police with rocks and pieces of concrete," Szijjarto said. "This attack is coming from Serbian territory. Therefore, I firmly asked my Serbian colleague to call on Serbian authorities to act immediately against this aggressive group of migrants." "@peterlane5news: Heavy use of tear gas now to disperse crowd at #Horgos border gate. @5_Newspic.twitter.com/HxfKSKml08"
Following the incident, Budapest reportedly ordered the Roszke-Horgos border crossing between Hungary and Serbia to be suspended for 30 days. Romania has summoned the Hungarian ambassador over Budapest’s decision to extend the border fence to the country's southern border with Romania. Earlier, local witnesses reported that Hungarian military surveyors and engineers were spotted on Wednesday mapping out the line of the border fence’s extension along the frontier with Romania. Meanwhile Prime Minister Victor Orban told Austrian newspaper Die Presse that Hungary plans to also build a fence on parts of its border with Croatia. Hungarian authorities are struggling to deal with massive influx of asylum seekers. On Monday, they finished erecting razor wire fences along the border. An apocalyptic-looking train wagon with razor wire attached at the front was used to seal a railway passage near the village of Roszke. This blocked off the last crossing point with Serbia except for official road checkpoints. On Tuesday, Hungary decided to declare a crisis in two southern counties due to the influx of asylum seekers. According to Gyorgy Bakondi, head of the national disaster unit, the border zone in these counties would be extended to 60 meters from 10 meters. "This can serve to temporarily place persons seeking refugee or protected status as well as to process asylum claims and alien registration procedures," he said. Later, police data showed that only 366 asylum seekers had been rounded up by Hungarian police on Tuesday. On Monday at least 9,380 were rounded up by Hungarian police.